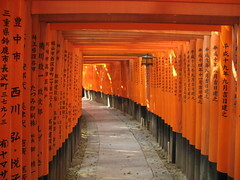 Search online for images of Kyoto and you’re bound to find the red gates of Fushimi Inari. We walked through a smallish group before veering off into a gorgeous bamboo forest. The stalks were up to four inches thick and dozens of feet high. I’d love to bush whack across a mountain side like that at some point. Maybe climb a bit and try swapping from stalk to stalk up there in the leaves. Off on this wander we passed some allotments and it was easy to forget how close the busy city of Kyoto is. The majority of the gates are in a loop away up a long path. It was quiet in the afternoon and the mountain paths had an ambience that mostly kept me silent and observant. 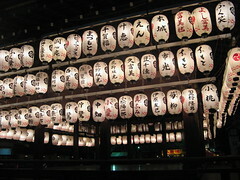 There are many thousands of those gates in many different sizes. The smaller ones are for sale and dotted around shrines and graves. 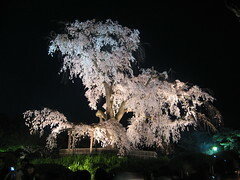 The final stop for the night was Maruyama Park and the biggest weeping cherry tree in Kyoto. The park was packed tight with food stalls, beer stalls and cherry worshipers. Imagine the Chinese Lantern Festival but with cherry blossoms instead of lanterns and Japanese instead of Chinese, and the occasional shirtless drunken youth supported by the best of friends, chucking up into the pond. Today was not so fun. I shot off to the Immigration Office, then City Hall, then the Ward Office in search of a foreigner registration card. Of all the places I’d expect the officials to have some English skills this would be near the top of the list and I’d be wrong. The entire process was handled in Japanese and when things got really tricky Charles (my cousin’s friend who has only met me once) was reachable by phone to translate. He really saved my trip and therefore my plans for 3-5 years in Japan. Being deported really would have put a dent in things. Through all of that Lorraine was organising accommodation and that has put us in a ryokan on the far north of town. It’s small and strict but it’s good to have stayed in one once (again). Now I’ve prattled on far too much so I’m going to bed. Oh yeah, it’s been raining all day so no temples and we’re leaving town tomorrow. 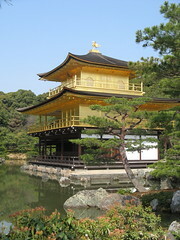 The photos provide a beautiful reminder of Kyoto. Glad to hear you opted for Japanese-style accommodation. It will add to the experience. …great blogs…certainly gives the reader a feel for the place, and you in it. choice!